Glitz, glamour, sophisticated architecture and a melting pot of cultures; these are quick impressions of Dubai for a first-time visitor. It is complemented by the truly welcoming atmosphere of the city, making it not only a global hub for businesses but also one of the most popular tourist destinations. The largest of the seven emirates comprising the United Arab Emirates, Dubai is located on the south-east coast of the Persian gulf. Right in the midst of the Arabian Desert, Dubai has always been a strategically important port, facilitating business growth for decades. 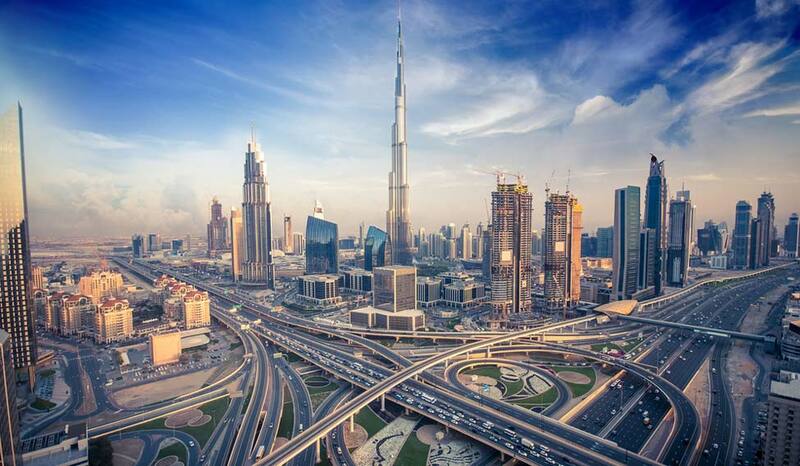 Dubai witnessed an unprecedented surge in growth after the discovery of oil in the region in 1970s. Dubai is renowned for its skyscrapers that exude elegance and opulence combined with excellence. While in the city, do visit some of its spectacular buildings—one of which is the Palm Jumeirah. 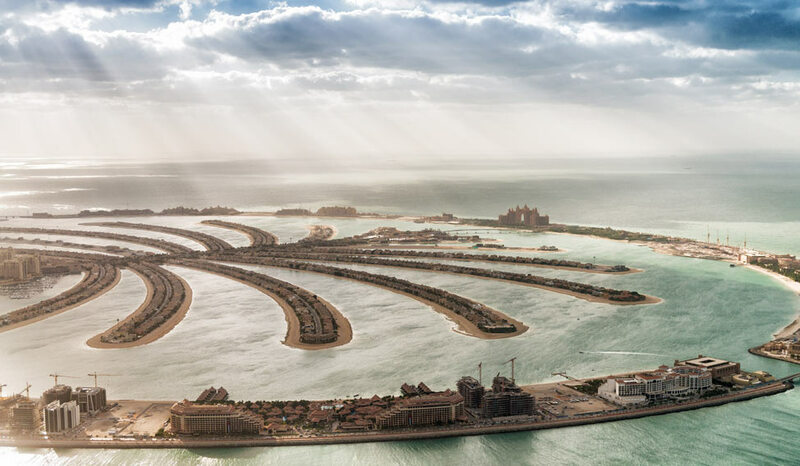 Touted as an engineering marvel, Palm Jumeirah is a fascinating manmade island built on the waters of the Arabian Gulf. The top view resembles a palm tree with a trunk and 17 fronds making it a truly spectacular sight. With a plethora of themed restaurants, hotels, villas and stores, it is a hotspot for adventure, fun and pleasure for tourists and locals alike. So, from enjoying sea life to swimming with dolphins or getting up close with sea lions, the Palm Jumeirah has it all. Some of the popular places to visit are the Aquaventure Waterpark, the Lost Chambers Aquarium and Dolphin Bay, besides the world famous 5-star aqua-themed hotel Atlantis. Dubai is also home to the most expensive and luxurious hotel in the world, Burj Al Arab. A contrasting experience and far removed from the unparalled modernity is the Bar Dubai Creek. A historic area replete with the retro look, this sea water creek in the heart of Dubai is a pleasant picture of the old world charm. The creek divides the city into two districts—Bur Dubai and Deira. Vintage old-style buildings, wooden dhows (old fashioned boats), lively markets and a bustling port give the creek a unique character. Best explored on classical dhows, the creek, in fact, was the centre of trade and commerce wherein merchants and traders conducted negotiations and exchanged goods for the fishing and pearl diving businesses. A must visit are the two most famous traditional markets of gold and spices. While the former is very popular with Indians who love purchasing gold, you can pick up some authentic spices and native perfumes as well as incenses in the spice market. Clocking millions of visitors each year, the Dubai Mall is the world’s largest retail and entertainment centre. 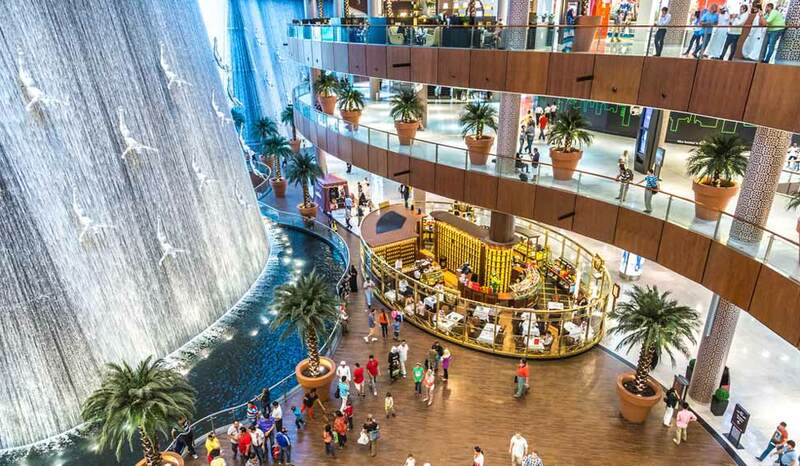 With countless options for shopping, dining and specialities that include an aquarium and an underwater zoo, the mall is located in downtown Dubai. While it is the highstreet fashion capital of the region, The Souk is yet another distinguishing feature of the mall that has some truly classic shops retailing niche jewellery, Arabic clothes and accessories. With an open-air streetscape, indoor theme park and an Olympic-sized ice rink, there is never a dull moment in this phenomenal offering that caters to the international audience of the city. Soaring at 828 metres, this world renowned iconic structure is literally the symbol of the city and represents the zenith of engineering and architectural brilliance. Designed by Adrain Smith, this structure was completed in 2009 after five years of construction. With residences, office spaces, hotels, observation decks on the 124th, 125th and 148th floors and the worlds’ highest restaurant, the Burj Khalifa is a masterpiece not to be missed when in the city. No trip to Dubai is complete without the enjoying the essence of its landscape which is the majestic desert. There are several local tours companies that offer thrilling rides on these sandy terrains that entertain you by diving deep into the ditches one minute and accelerating back to the dune summits the next. 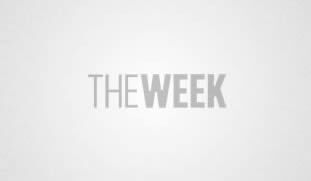 Truly mind blowing, these packages often include items that showcase the local culture like a belly dancing show and camps at an Arabic Bedouin site. Sip Arabic coffee or enjoy a gourmet barbeque dinner while watching the sunset over the dunes. The latter is nothing short of spectacular. You can also indulge in unique experiences like riding a camel, adorning an Arabic traditional dress or even try your hand, or rather legs at desert walking! A stunning white mosque and the only one in Dubai that allows non-Muslim guests six days a week, the Jumeirah mosque is yet another must visit. A symbol of the open minded culture of the city, the mosque allows conducted tours that last about 2 hours for visitors from Saturday to Thursday. Photography is allowed so make sure you carry your camera when you visit this holy place. The monument is a compelling sight at night. With fabulous lighting, the facade of the mosque appears in all its artistic glory. This large mosque that has a capacity of 1200 people has been constructed in the medieval Fatimid style. Make sure you maintain the decorum and adhere to the dress code which is to dress modestly while visiting this religious site. Women are usually asked to cover their heads with a scarf.